Order one for each TN office and location to be fully compliant. 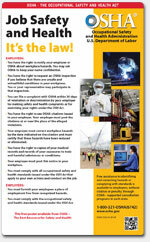 OSHA and TOSHA Posters are included on the Tennessee Complete Labor Law Poster. 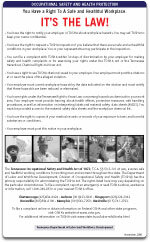 When you order the Tennessee Complete Labor Law Poster, it will satisfy your State, Federal, and OSHA posting requirements with one poster. 05/2018 - Workers' Compensation - Major poster revision including a new title, language on when/how to report an injury, and a new required fill-in field. 02/2013 - Unemployment Insurance - Update to Unemployment Insurance; very comprehensive update to include new information on website and guidelines on what documents to gather to apply and what telephone number to dial for more information. 05/2009 - Discrimination Notice Poster - Updated to reflect revised Middle Tennessee address and minor content change. 03/2017 - Unemployment Insurance - Update to Unemployment insurance, changes includes, removal of telephone number, website revision and minor formatting changes. 10/2015 - Unemployment Insurance - Revisions include address changes, website listings, new telephone numbers and other minor layout reformatting. 10/2015 - Workers' Compensation - Revisions include address changes, website listings, new telephone numbers and other minor layout reformatting. 10/2015 - OSHA - Revisions include address changes, website listings, new telephone numbers and other minor layout reformatting. 10/2015 - Child Labor Law Poster - Revisions include address changes, website listings, new telephone numbers and other minor layout reformatting. 02/2015 - Workers' Compensation - Updated with new guidelines for covered employees and what employers should do if injury occurs and new department name for Tennessee Division of Workers' Compensation. 10/2014 - Discrimination Notice Poster - Updated with new business address information and website listing. 05/2012 - NLRA (National Labor Relations Act) Poster - NLRA (National Labor Relations Act) Poster. Many industries such as the restaurant, retail, construction, and professional use the Tennessee Complete Labor Law Poster to satisfy their compliance requirements for State, Federal, and OSHA. When posted in an area frequented by employees, the Tennessee Complete Labor Law Poster puts a business in full compliance. Federal contractors and subcontractors are required to display more postings in addition to the general State, Federal, and OSHA regulations. Please click here to see the federal contractor and subcontractor posting requirements. Ensure your full compliance by posting the Tennessee Complete Labor Law Posters with the federal contractor-required postings.